I went to Sephora to get a new eyeshadow kit from Benefit (they are becoming my favorite brand along with Laura Mercier) and to Express to see about two dresses I saw online. They are currently having a sale with 30% off all dresses so hurry up and see them this weekend, I don’t think it’ll be on much longer. At home, I was waiting for a little time to pass before I went downstairs to collect packages as I saw one was waiting on me and I knew another was to come. When I went, I had 3 packages waiting! 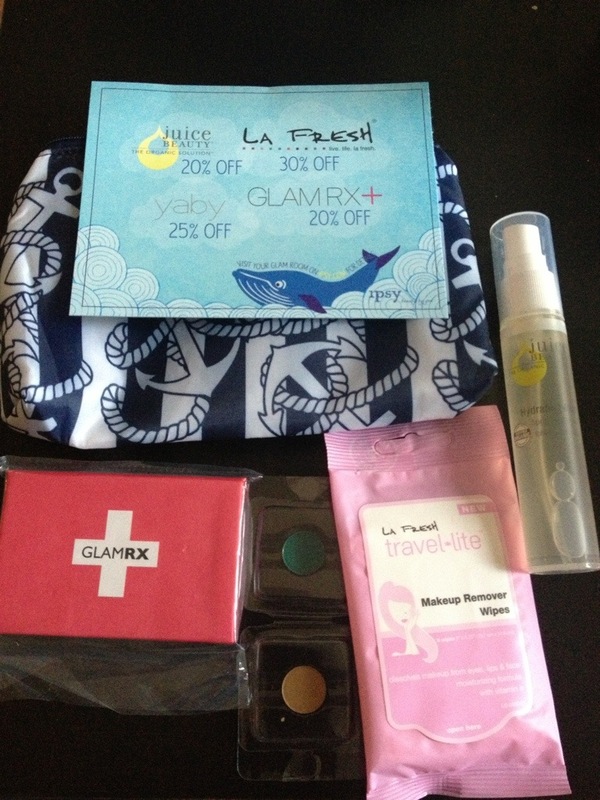 *Yay* One was my Ipsy bag, which is carrying a nautical theme for March (isn’t that lovely considering my last post!? 🙂 ) My skirt also came from River Island today, as well as my blazer and a scarf I forgot I ordered with it. Would you believe it has stripes as well?!? :D.
Who goes to Sephora for one thing and leaves with only one thing?! 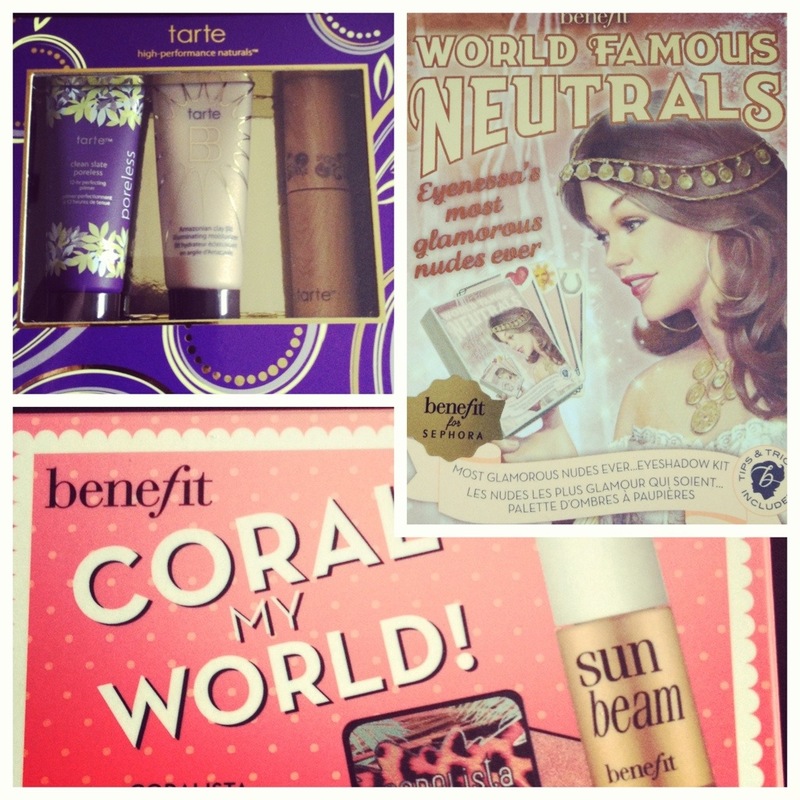 I wish I could… Besides the Benefit World Famous Neutrals – Most Glamorous Nudes Ever eyeshadow kit the one thing I went for, I got the Tarte Prime, Shine & Define Tarte-To-Go kit and Benefit Coral My World!. I love trial sizes because besides the fact that it’s the easiest way to test out a product without paying the full price, if I like it, I can keep it to travel with and then buy the full size to keep at home. Then I went to Express. Let me say that at heart, dresses are the best item of clothing to me. Nothing beats them! I bought this blue dress before with my Express rewards, which meant I paid something like $11 after taxes for a dress that cost $39.90. I’m normally very excited about my Ipsy bag but I was very confused with what I was given this month. I had to go to the website to understand it and I’m very glad for this feature. I was trying to figure out the purpose of the GlamRX palette. The eyeshadows and the palette were explained as I have listed all of the descriptions from the website below. The GlamRX Mini Freestyle Palette was made exclusively for ipsy Glam Bag subscribers. The magnetic base is the perfect spot to store pan-only eyeshadows (2 of which are included in this Glam Bag! ), blushes & bronzers, or whatever you need for perfect for quick touch ups on the go! Whether you are headed off to spring break or just need a cute & clever way to store products in your bag, you can create the perfect makeup look and take it with you with your exclusive GlamRX Mini Freestyle Palette. And if you’re looking for even more cool on-the-go beauty, check out the Touch Up Palette from GlamRX. It is a unique, practical, pocket-sized palette that has what you really need on-the-go: brightening concealer, flattering tinted lipbalm, shine erase powder, black eyeliner, mirror. Includes eyeshadow/eyeliner applicator and a blush brush. The unique bottom level is the same magnetic palette that is included in the March Glam Bag. The GlamRX Touch Up Palette is available for purchase, just click the Buy It button! I’m looking forward (as usual) to trying out these products and any that really stand out I’ll do a review of. My Rihanna for River Island skirt fits perfectly! I can’t wait to wear it!! I think this is all I have to round up. More shipments coming next week plus some reviews of these kits.